Poker. Comic books. Minnesota. Yeah, this mystery is targeted toward me. Joey Cadillac is used car dealer in Chicago with a former Miss Minnesota (Chrissy Swenson) for a girlfriend. Joey feels pretty good about the deal he just made – he traded a beat-up Cadillac (on which he had rolled back the mileage) for some vintage Batman comic books. When Crissy insists on reading one of the comics, they discover that the ‘valuable’ old comics are blank inside. Now Joey is out for revenge. He knows the drivers of the Cadillac are headed to Minneapolis and he sends his muscle, Freddy, to deal with them. In Minneapolis is Joe Crowe, a former cop and cocaine addict private investigator who loves to play cards. He’s hired by Rich Wicky to find out who his wife is having an affair with. Dickie’s and Cadillac’s paths will cross as each tries to get the upper hand in a high stakes game of poker for some valuable comic books. Author Pete Hautman has created a delightful mystery with some very memorable, lovable characters. Characters drive a novel for me and I really didn’t expect to like this group of lowlifes as much as I did. But these are affable characters, not nearly as dangerous as they would like to be, which really works in their favor. What is there, in terms of plot and character is really well done, I’m definitely interested in reading more Hautman, but the book was decidedly missing something – some hook to keep me really engaged throughout. Looking for a good book? 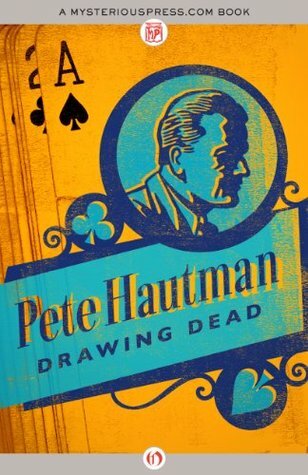 Drawing Dead by Pete Hautman is a fun, lighthearted mystery with great characters but a little thin on story.